1402 North MacGregor Way was designed by S. R. Slaughter and built in 1935. 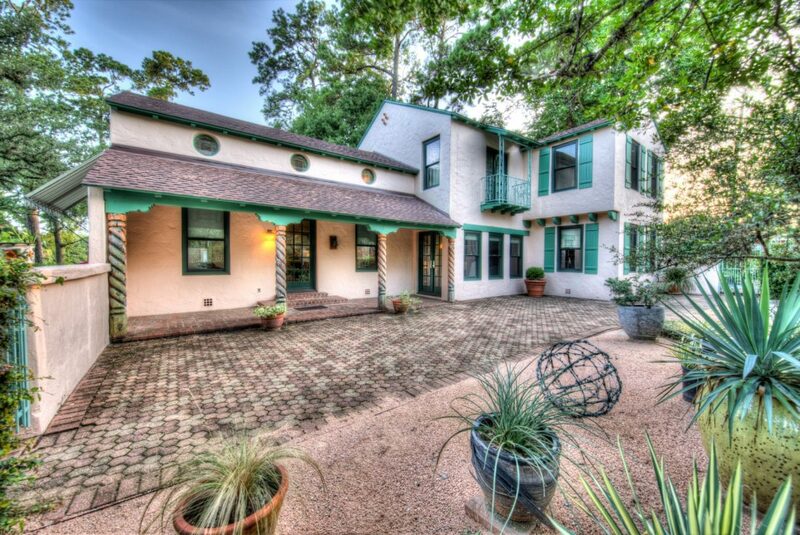 The Houston Architectural Guide describes it as “an imageable Spanish Mediterranean house.” Oriented toward the southeast, the two-story, three-bay house is irregular in plan and contains two principal blocks. Resting on a pier-and-beam foundation, the house is wood frame, and clad in painted stucco. The asymmetrical façades feature one-over-one wood sash windows with applied shutters, as well as round windows in the upper story of the eastern block, and a large arched window on the east. A one-bay shed porch extends over the entrance at the northern façade of the eastern block, and contains a single original multi-light wood door. The porch columns are decorative wood with a twisted appearance, and the porch deck consists of brick paving. The multi-part gabled roof has a medium pitch with exposed rafter tails at the eaves and cylindrical tile gable end vents. It is covered with composition shingles. A tall stuccoed chimney with a decorative pointed-arch cap is located on the southern façade. The heavily vegetated landscape features a stuccoed wall, approximately five feet high, which extends along the eastern and northern property boundaries. This wall, along with a metal fence, large old-growth trees, and lush bedding plants create a secluded setting for the house. The house has been little altered, retains its integrity, and is a contributing element of the historic district. An original garage apartment stands at the rear of the lot; although a carport has been attached to the garage apartment, it retains its form and function and contributes to the historic district. 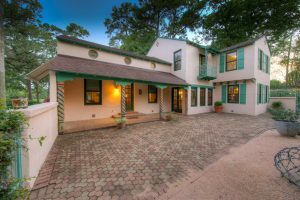 From the original oversized arched window overlooking the front of the home, to the second-story balcony spanning the living room, to the pink stucco exterior, this 1934 Spanish Colonial home lives up to its name. 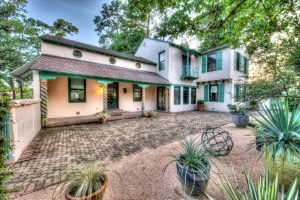 The paved patios and pond, open covered porch, voluminous vaulted ceiling with old dark wood beams, ceramic Malibu tiles and arches enclose equally intriguing art and artifacts. All updates have lovingly maintained the historic integrity. All photographs of the interior and exterior of the homes on tour as well as the “Beautiful Idylwood” photographs are copyright © 2018 & beyond by James McCallum, all rights reserved.